Have you ever read an Odelia Grey Mystery? Whether or not you have already been introduced to the plus-sized paralegal who has a talent for "nosing" out corpses (compared to that of a pig finding truffles), you will want to read this book. This is mystery with a strong dose of humor, something we all need after a long cold winter. It sports headline grabbing storage wars, odd relatives, and a great plot. 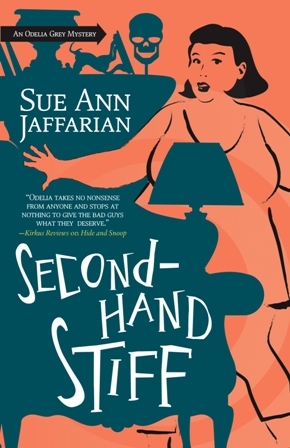 Jaffarian does not miss a beat as she deftly takes her readers into the world of storage locker auctions, the awful world of the victim and into the ever better world of her own family, a loving husband (in a wheelchair) and a re-igniting relationship with the mother who abandoned her years before. There is no lack of action in Jaffarian's books. In fact some of the psychological action is so intense I find myself classifying it with the physical action! At the same time, we are given detail enough to come to love Odelia and those she loves and to value the others around her, even the bad guys. I think this is one of the things that set these mysteries apart for me. Jaffarian has a deep respect for people; even the bad ones have value. This colors (no pun intended on heroine Grey) the way she develops the novel. No simpering sympathy for bad guys — or even the good ones — but the respect for her characters spills over to respect for her readers as well. She doesn't care if we are bordering on plus size, if we can (as a friend of mine can) still fit into our size 6 wedding dress from 40 years ago, or who we are. She treats us to a well crafted plot, does not take short cuts, and amply provides enough detail for us to enjoy the scenarios and understand the interaction among characters without getting lost. This is the eighth book in the series. Each one is a gem. As with any good series there is character development from the first book, TOO BIG TO MISS, to the present volume. However, Jaffarian crafts each novel so well that you can pick up the series at any point and not feel like a late guest at a party. In addition to writing the Odelia Grey series, Jaffarian has two other series on-going at present, Madison Rose and Ghost of Granny Apple. The New York Times and many others have lauded her books and she is sought after as a humorous motivational speaker proving that she is as good behind the podium as she is with the pen. This is definitely a series to enjoy. I hope for more Odelia Grey books in the near future. The next book in the Odelia Grey series, HELL ON WHEELS, is scheduled for release on November 8, 2014. Please click here to read an interview with Sue Ann Jaffarian. Copyright © 2014 Joan Leotta. All rights reserved. Reproduction in whole or in part in any form or medium without express written permission of Over My Dead Body! is prohibited. OMDB! and OMDB! logos are trademarks of Over My Dead Body!